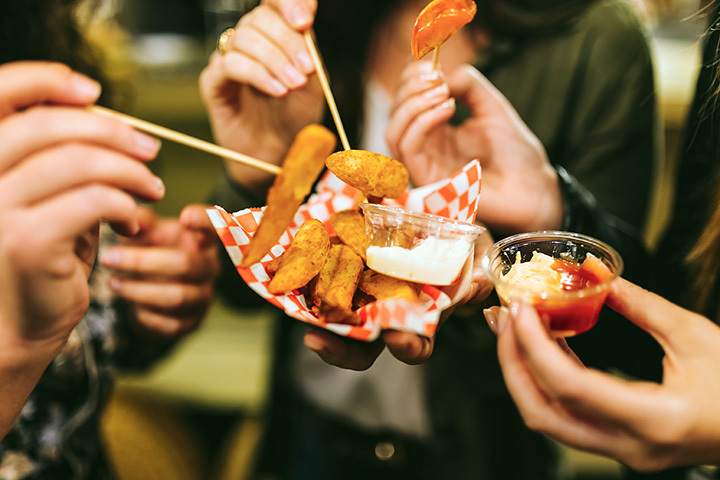 Whether you prefer your French fries the old-fashioned way, salty and well-seasoned, or reinvented, with unique toppings and preparation, you’ll find lots to love at the following ten best spots for French fries in Maryland. Be warned: You won’t be able to eat just one. Thrasher’s Fries is a Maryland fixture and has been for close to 100 years. You can read endless reviews exclaiming the wonder of these fried spuds, but the bottom line is this: they’re great. Enjoy at any of their three Ocean City locations along the boardwalk or pier. Baltimore, Maryland’s Salt: A New American Tavern adds new touches to old American favorites. You can’t get much more American than French fries. Theirs is prepared with duck fat and served with black truffle and an old bay malt vinegar aioli. The Real Thing in Towson, Maryland, offers great cheesesteaks, but the six different kinds of French fries can’t help but steal the show. Choose from regular French fries, jalapeno cheese fries, pizza fries, gravy fries, or steak fries topped with steak and melted cheese. You can’t go far without running into an Urban Bar-B-Que Company in Maryland. They’ve got 12 locations throughout the state from Leonardtown to Rockville and more. No matter which location you frequent, you can expect delicious barbecue and perfect salty, crunchy fries. Beef ‘n Buns ‘n Paradise serves just that: burgers, jumbo dogs, wings, sandwiches, ice cream, and fries. Choose between a 16 or 32-ounce tub with brown gravy, nacho cheese, or chili. The adventurous might choose sweet potato fries instead. Sardis is another Maryland chain with 10 locations scattered throughout the state and in places like Bowie, Beltsville, Takoma Park, and more. Try fries with a Peruvian twist with the fried yucca, or go for their lip-smacking good American-style French fries. Gus’s World Famous Fried Chicken has locations throughout the country, but only one in Maryland. While the chicken is nothing to scoff at, the perfectly seasoned fries often make Gus’s return-trip worthy. The Broad Axe aims to offer “pub food done well.” This gastro-pub style restaurant offers fresh cut fries, hand cut and well-seasoned as a snack or a side. Metro City Wings is constantly created French fry surprises. Specials include the DMV Steak and Cheese, a platter of delicious fries, steak, and cheese. Fries topped with crab, shrimp, and more are frequently offered.